Hi everyone! Thanks for stopping by today. I hope you are having a fabulous day! I am excited to share today’s project with you because it’s a little something different from what I normally share. 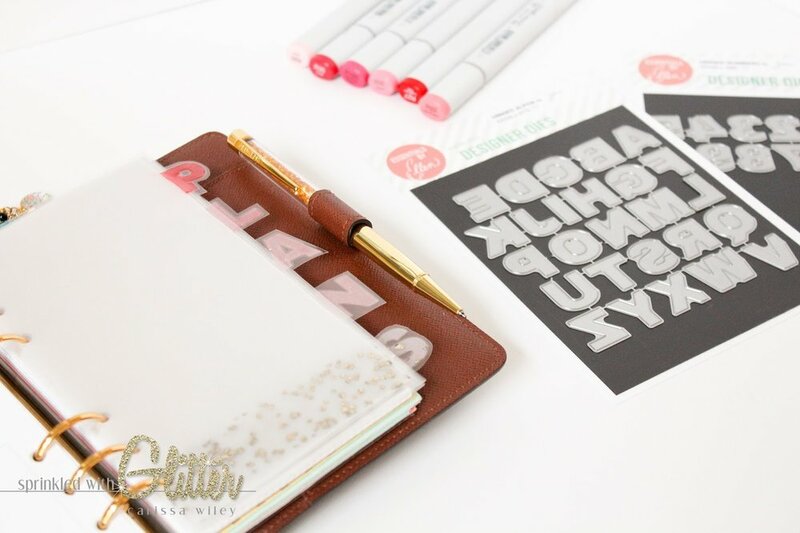 Today I’m going to share some awesome vellum planner dividers that I made using the brand new Hinged Alphabet Die set from the Essentials By Ellen line. Not too long ago, EllenHutson.com release the Hinged Thanks Die. I created a fun card project featuring that die. You can check that out by clicking HERE. This die was so popular that they decided to create an entire alphabet and number set using the same concept. And that’s how the new Hinged Alphabet and Hinged Numbers die sets were born. I love the versatility of these dies. You can use them to create letter tabs (like I’m doing in today’s project) or you can use them to create fun hinged windows on your cards, scrapbook pages, treat bags and more. The size of these letters seems just perfect. I will walk you through the creation of these dividers in the video tutorial below. I’ve also added a little bit of foiling to the bottom…because….well…because I’m Carissa and I have an addiction to shiny things. To add an ombre effect to the letters, I used some Copic markers to color the backside of the vellum. I finished these dividers off by laminating them to make them sturdy. 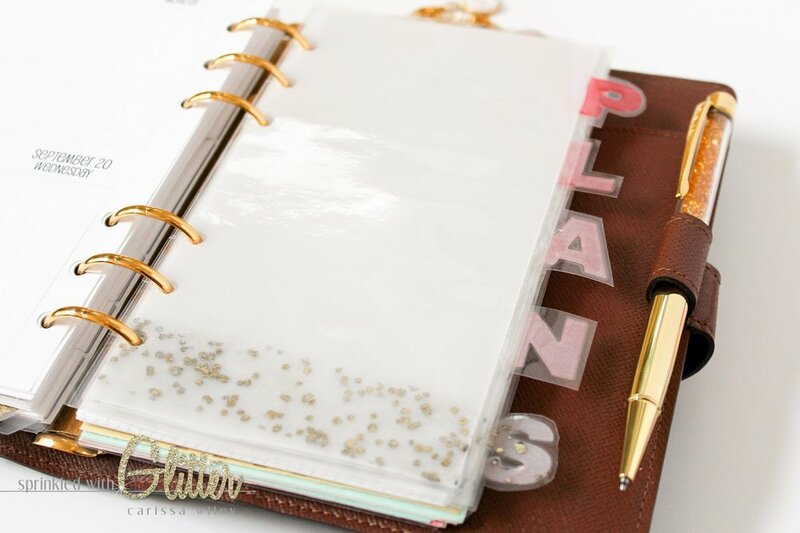 While this post really isn’t about my planner itself, I knew a few of you might ask some questions. I will do a more in depth look at my planner if enough people would like to see that…but in the meantime, here’s the basics. I’m using a Louis Vuitton agenda cover in the MM (medium ring) size. This is comparable to a Filo Fax personal sized planner. The pages are approximately 3.75 x 6.75 inches. I love this size because it’s portable enough to carry in my purse, yet large enough for me to write everything I need. You can find the agenda cover by clicking HERE. I’m currently using inserts from Sew Much Crafting on Etsy. I love the boxes, because they will fit all of those cute stickers people are making for Erin Condren planners…which I like to sprinkle in here and there just to add some fun color. Since my to-do list is often as long on the weekends as it is during the week, I like that the same amount of space is allotted for each day. And then there’s a space for me to keep a weekly to-do list. 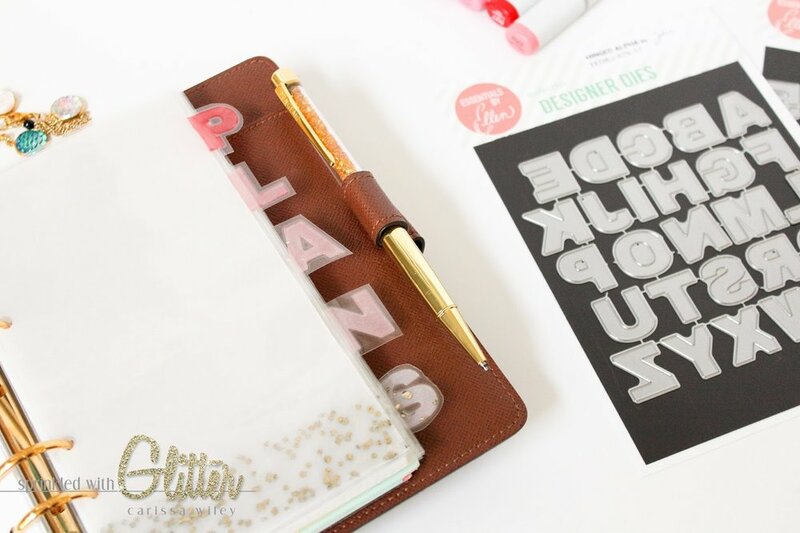 You can find these inserts, the monthly spreads and note paper inserts I use by clicking HERE. 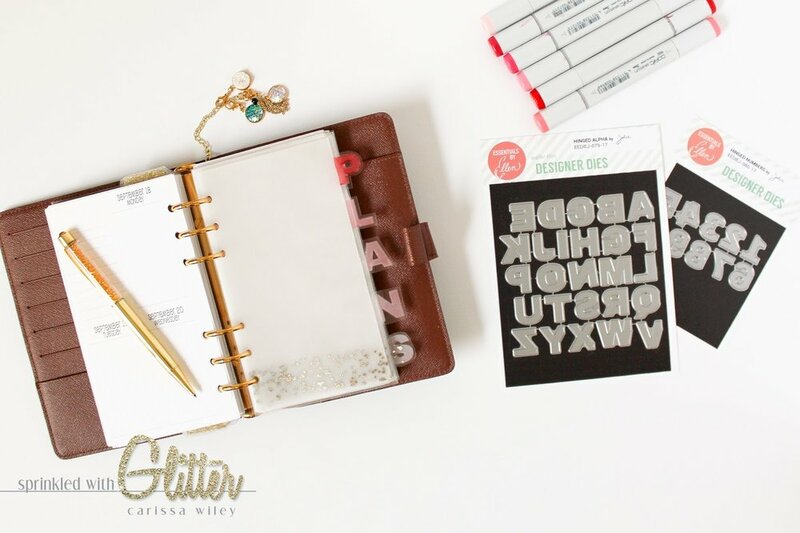 If you love my adorable planner charms, be sure to check out Hello Simple Paper on Etsy. You can find them by clicking HERE. I have mermaid charms and a druzy charm. And I LOVE them. They serve absolutely no other purpose than to make me smile and remind me of my true mermaid status. My pen….I mean…it’s amazing. What more could you ask for? I love it. It’s from the Pen Gems Hollywood Boulevard collection. They come in all sorts of colors. I like to get the uni-ball Jetstream Hybrid 0.7mm refill (available in the Pen Gems refill section) and use that instead of the ink that comes in the pen. It’s perfection. And they make adorable gifts. People go gaga over them. You can click HERE to shop the Pen Gems site. Thanks for stopping by today. I really hope you’ve enjoyed this project and a look at the new Hinged Alphabet and Hinged Numbers die sets. Until next time, I hope you have a fabulous day! Altenew May Product Release Blog Hop $30 Gift Certificate Winner!